Given the importance of neighborhood change in urban sociology, I thought that student interviews of residents in Grove Park would be the perfect way to bring life to these discussions about gentrification and urban renewal. 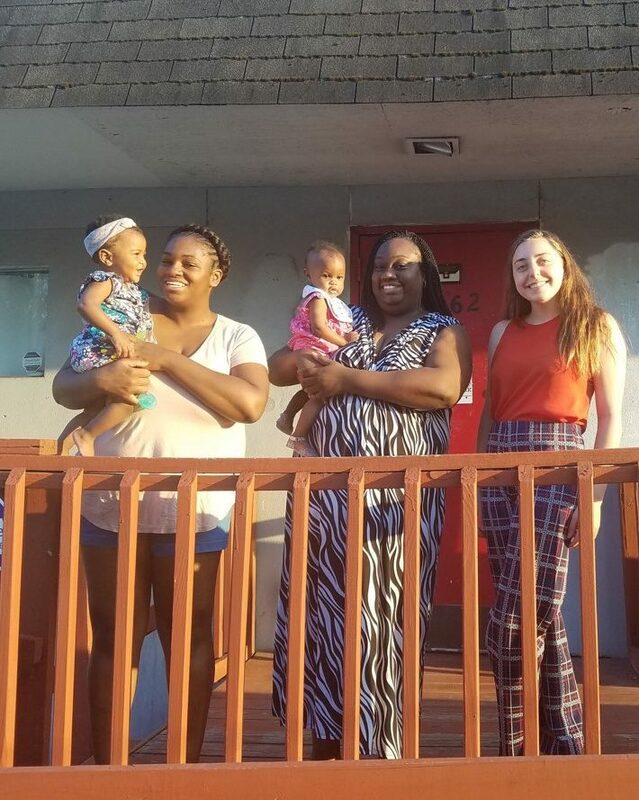 In my two Urban Sociology courses in 2018, I thus partnered with the Grove Park Foundation4 and the Serve-Learn-Sustain Program at Georgia Tech to have students interview residents of Grove Park about changes in their neighborhood. These oral histories are part of the foundation’s ongoing project to preserve important stories and histories of current and former Grove Park residents. Currently, my students have conducted twelve interviews of fourteen different residents about changes in their neighborhood, as well as their hopes and concerns about the future of Grove Park, producing over ten hours of audio and over one hundred pages of text in the process. We then uploaded the interviews to the StoryCorps App, which is modeled after the Works Progress Administrations efforts to maintain oral histories during the Great Depression, in order to archive them online as a public record of residents’ views. With the permission of the interviewees, these interviews are also archived at the American Folklife Center at the Library of Congress for future generations to hear. This project also gives voice to the residents and provides a record of their wants and concerns that is available to be used by the neighborhood association. Before conducting the oral histories, the students first conducted mock interviews with one another about their own neighborhoods, which provided them with the experiences of interviewing and being interviewed. Students were asked to critically reflect upon some of the ethical issues associated with interviews, as well as how their own social statuses may shape their interactions with the interviewees. Accordingly, each student completed IRB training, which further emphasized the ethical stakes involved in oral histories. 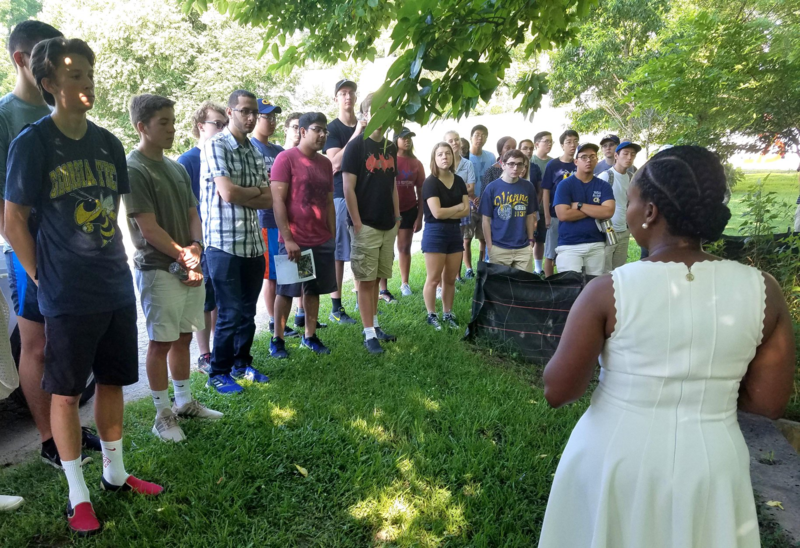 Before interviewing residents of Grove Park, students also went on a walking or bus tour of the neighborhood led by the Grove Park Foundation, which focused on the neighborhood’s history, the current issues that it faces, and planned future developments. 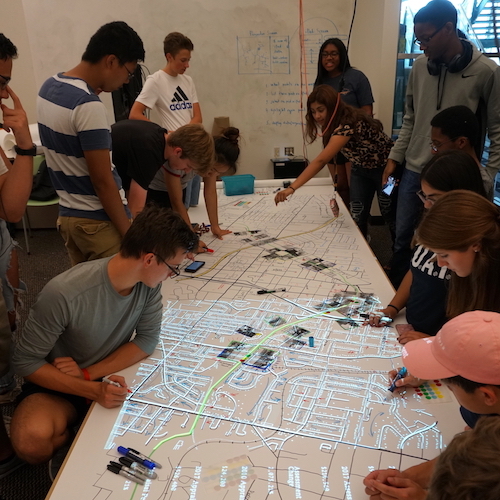 Finally, the students discussed the Atlanta Neighborhood Planning Unit (NPU) system with Al Bartell, the chairperson of NPU-J, which includes Grove Park. Georgia Tech iGniTe First Year Summer students take a walking tour of Grove Park with the Grove Park Foundation and West Atlanta Watershed, learning about the importance of the park and the challenges to environmental justice in the community. Photo Courtesy of Author. As is the case for many neighborhoods on the Westside, white flight and the subsequent flight of the black middle class5 has led to major demographic shifts in Grove Park over the past few decades, which also contributed to population and business loss. Today, Grove Park has no grocery store (making it a food desert), pharmacy, or bank.6 Thus, ongoing investments in the neighborhood have some very excited for a revival of social and economic life in Grove Park. However, others are concerned about how these investments will affect the neighborhood, particularly in relation to the costs of rent, the community culture, and displacement of low income and elderly residents. Given that the changes in Grove Park are currently in a relatively early phase compared to other neighborhoods like Old Fourth Ward, I was particularly interested in assessing and understanding how current residents’ views of the prospects of urban renewal and gentrification in Grove Park might vary. While we have not reached any definite or generalizable conclusions about how residents of Grove Park view current and future changes –we have only spoken to twelve of the nearly 5,000–6,000 residents, and our sample was non-random with residents identified for interviewing by the Grove Park Foundation – we nonetheless noticed several patterns among the residents’ views that are worth highlighting. 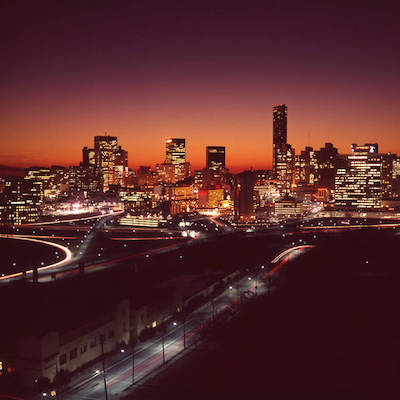 Overall, residents seem to be excited for change; however, they hope that investors, new residents, and local government remember the wants and needs of the current residents as opposed to future residents of a completely different demographic. It was transitioning because both of our neighbors on each side were white at the time, but they were really nice. But it was transitioning from an all-white area to black folks moving in, but we didn’t have any problems then. Like I was telling him earlier, we had a screen porch, and we’d just put a little TV out there and sleep on the screened porch. We didn’t have to worry about folk coming up with a gun or trying to break in and rob you. It was family friendly. The kids all played together on the street, in the street, running down the street, riding bikes, skating. Each of the legacy residents that we interviewed brought up similar hopes about the future of Grove Park: they hoped that new investments in the community would bring back the close-knit, family friendly community that existed before white and middle class flight. I want to see the people who are here benefit from the growth. You know? There’s a lot of great ideas, there’s a lot of entrepreneurs, there’s a lot of initiatives. We just need a boost, you know? We need a boost. We need start up, we need support, if we could get that, I think we can solve a lot of, I think the ideas are here, the energy is here, it’s the, you know, it's the capital, you know, we need to support – I would love to see the focus on small businesses, like myself, and my neighbor Rayne and my neighbor John, you know, who all have love for this neighborhood and want to create economy here and can’t yet. I’ll be seventy years old at the end of the month, so I am a senior, and I worry about people that are older than I am being displaced, and I think about, I’m getting older, and I hope I’m not one of those people. You know so, long as they can come in and not displace the seniors, and have some programs that are viable to help them stay in their communities, it’d be a great thing . . . if you’re not being informed then quite naturally you’re going to have to feel some resistance to change. But long as you’re informing people of what’s going on and keeping them involved, and keeping them in the loop, then there shouldn’t be any problems. Several of the residents admitted that some displacement would occur, regardless of the measures taken place to reduce it, though. As the neighborhood becomes more desirable, increased demand for properties will typically drive up housing prices, thus pricing out some residents. I’m not interested in living in an all-black, all-white, any of that. I’m interested in a diverse neighborhood, so I welcome my new neighbors, but we already have an identity, so if you want to live here, you have to get on board with what we already are. We’re not interested in being cultivated into some new thing. Through this project, my students and I learned quite a bit about the history of and contemporary issues facing Grove Park, particularly in relation to urban revitalization and gentrification. It is one thing to read about gentrification, but speaking to residents who face these issues in their everyday lives provides new light to our understandings. We also learned how to be better neighbors to the neighborhoods that border Georgia Tech reaching out to folks who live in their communities to better understand their wants and needs and respecting the importance of local knowledge, which is often overlooked. I also hope that the students understand that the communities where they live, work, and play have complex histories and that the decisions that they make and actions that they take will often create unintended and unequal consequences for these communities. We hope that the interviews might also be used by NPU-J and the Grove Park neighborhood to lobby for additional resources that meet the wants and needs of current residents. Finally, community leaders and residents like LaTonya Gates-Boston, the founder of PAWkids, reminded us to remember the people who are already living in the neighborhood: the youth, the pastors, the elderly, the aspiring entrepreneurs, and the person on the corner. They all want to be part of its future too. Grove Park residents and a Georgia Tech student pose after completing one of the interviews. Photo Courtesy of Author. 1. ↵ Dan Immergluck and Tharunya Balan, “Sustainable for Whom? Green Urban Development, Environmental Gentrification, and the Atlanta Beltline,” Urban Geography 39, no. 4 (2018): 546–62, https://doi/abs/10.1080/02723638.2017.1360041. 2. 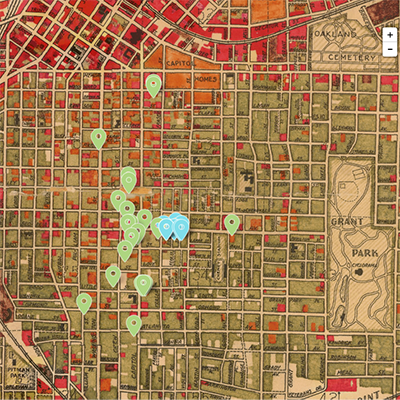 ↵ Two examples of such expert-centering coverage of gentrification include: Benjamin Powers, “Putting the Brakes on Runaway Gentrification in Atlanta,” CityLab, November 10, 2017, https://www.citylab.com/equity/2017/11/putting-the-brakes-on-runaway-gentrification-in-atlanta/545555/; Aryanna Brown, Caleb Cherry, and Jordan Owens. “VOX ATL Commentary: Gentrification in Atlanta’s West End — Bringing Positive Changes,” WABE, June 21, 2018, https://www.wabe.org/vox-atl-commentary-gentrification-in-atlantas-west-end-bringing-positive-changes/. 3. ↵ For examples of such coverage, see: Bill Torpy, “Torpy at Large: Uneasiness Along Atlanta’s Newest Gentrification Front,” Atlanta Journal-Constitution, May 30, 2018, https://www.ajc.com/news/local/torpy-large-uneasiness-along-atlanta-newest-gentrification-front/O54egpglE5raf4KyJEOJaN/; James Lartey, “Nowhere for People to Go: Who Will Survive the Gentrification of Atlanta,” The Guardian, October 23, 2018, https://www.theguardian.com/cities/2018/oct/23/nowhere-for-people-to-go-who-will-survive-the-gentrification-of-atlanta. 4. ↵ The Grove Park Foundation is a local nonprofit that “is dedicated to revitalizing the Grove Park neighborhood and improving the quality of life by working with local partners, leaders and residents to create a healthy, equitable and vibrant community.” “Who We Are: Overview,” Grove Park Foundation, accessed March 1, 2019, https://groveparkfoundation.org/who-we-are/overview/. 5. ↵ For more information about the early stages of white flight in Grove Park during the 1950s and 60s, see: Kevin Kruse, White Flight: Atlanta and the Making of Modern Conservatism (Princeton, NJ: Princeton University Press, 2005), 97–104. For more on the phenomenon of increased black suburbanization which has resulted in further disinvestment of black urban neighborhoods like Grove Park over the past few decades, and is sometimes referred to as “black flight,” see Chapter 9 of Andrew Weise, Places of Their Own: African American Suburbanization in the Twentieth Century (Chicago: University of Chicago Press, 2004). 6. ↵ For more on food deserts in Atlanta, see: Jerry Shannon, “Mapping Food Insecurity in Metro Atlanta,” Atlanta Studies, June 20, 2017, https://www.atlantastudies.org/2017/06/20/jerry-shannon-mapping-food-insecurity-in-metro-atlanta/; Jerry Shannon, “From Food Deserts to Supermarket Redlining,” Atlanta Studies, August 14, 2018, https://www.atlantastudies.org/2018/08/14/jerry-shannon-from-food-deserts-to-supermarket-redlining-making-sense-of-food-access-in-atlanta/. 7. ↵ Mrs. Johnson, interview by GA Tech Student 1, StoryCorps, October 30, 2018, https://archive.storycorps.org/interviews/reinventing-grove-park/. 8. ↵ Torrie, interview by Allen Hyde, StoryCorps, July 10, 2018, https://archive.storycorps.org/interviews/grove-park-changes-over-last-decade/. 9. ↵ “Westside Future Fund, City of Atlanta Announce Anti-Displacement Tax Fund Program,” April 12, 2017, Westside Future Fund, https://www.westsidefuturefund.org/news/tax-fund/. 10. ↵ Darryl, interview by GA Tech Student 2, StoryCorps, July 16, 2018, https://archive.storycorps.org/interviews/grove-park-darryl/. 11. ↵ Torrie, interview by Allen Hyde, StoryCorps, July 10, 2018, https://archive.storycorps.org/interviews/grove-park-changes-over-last-decade/.